Only a handful of days left until the sweetest holiday of the year! You need to try these healthy & easy Valentine’s Day treat ideas. Fun fact about Lyss–not once has Valentine’s Day been a “romantic” holiday for me, but rather a day about love between family, friends, and food! Growing up, Valentine’s Day was always exciting because of the traditions my mom and I had made. We were avid V-Day cupcake bakers, each year trying to one up the previous through new recipes and elaborate decorating. It was a joyous, loving bake-at-thon that I looked forward to every year, especially since it was pretty much the only day all year we’d make cupcakes. The only photo I could find from me and my mom’s cupcake baking extravaganza. This one is from 2010. Now that I’m older and more conscious about my weight and the foods I am putting into my body, me and my mom’s cupcake wars are unfortunately a thing of the past. Therefore, this year I decided to try out something different and prepare 5 different Weight Watcher friendly treats & candies that are incredibly quick & simple to make. Each one is made to satisfy any sugar cravings without sacrificing daily SmartPoint allotment. LOVE! 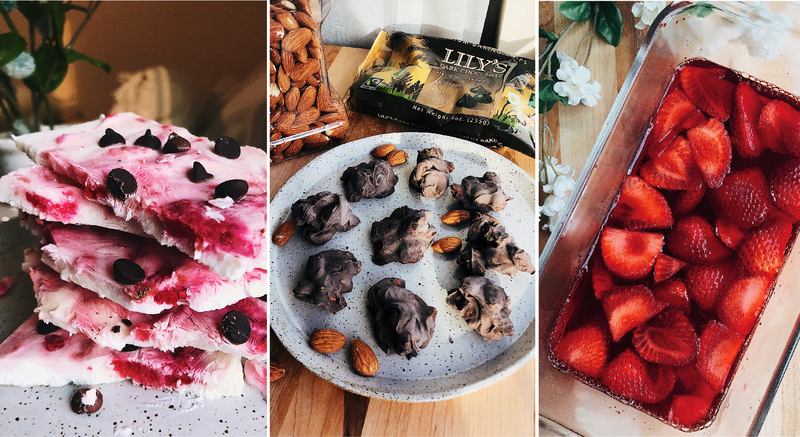 I hope you enjoy these easy Valentines Day Treat ideas, and they inspire you to create some delicious treats of your own. Now, let’s get down to business. Line a baking sheet with parchment paper. Any size sheet will do, just note that the size determines the thickness of the bark. I used a 10×15 in sheet pan. In a small pot, cook down the raspberries with 1 tbsp of maple syrup (or 1 packet of sweetener) on a low-medium heat for 5-7 minutes. Lightly smash them with a spoon & set aside to cool. In a medium size bowl, stir together yogurt, 2 tbsp sugar-free maple syrup & vanilla extract. Scoop out mixture and spread out on sheet pan. Next, dollop raspberries around yogurt mixture and spread out with a knife so the cooked down raspberries are evenly distributed. Sprinkle chocolate chips on top of mixture, as evenly as possible. Lastly, place bark in freezer for 2-4 hours. Divide bark into 5 sections, then break each section up “squares”. One section = 1 serving. Enjoy! Slice the strawberries into “hearts” or thirds, slicing them vertically. Prepare the Jello following the instructions on the box. You can use a jello mold, but since I don’t have one, I used a Pyrex loaf pan. Add the strawberries to the Jello mixture, and refrigerate for the time stated on box. Top servings with a dollop of whipped cream and enjoy. I swear, being introduced to Lily’s Chocolate was the greatest thing that’s ever happened to me. A coworker at my previous job actually told me about the brand and I’ve been hooked ever since. The possibilities are endless when it comes to these chips, but here are three insanely simple ideas I’m trying this Valentine’s Day. Important note: these chips are dark chocolate. Lily’s does come in milk chocolate, but in bar form. Prepare a baking sheet by lining it with parchment paper. I used a 10×15 inch pan. Using a double boiler, or this method, melt down the Lily’s Chocolate Chips on a medium to high heat. Be sure to constantly turn and mix the chips as they melt to avoid clumping and burning. Once the chocolate is melted, remove the bowl containing the chocolate from the boiler, and drop in the 1/2 cup of almonds & the packet of Truvia (adding it early on will cause chocolate to seize). Gently FOLD the almonds and Truvia together. This is important, or else the chocolare will begin to solidify. Begin spooning out clusters on baking sheet. I used a little less than a tsp per cluster, and got around 5-7 almonds in each. Try to get them as even as possible. Chocolate covered pretzels are one of my favorite desserts, and this version is to die for! Want some extra sweetness? Dip these into some Halo Top ice-cream. YUM!! Using a double boiler, or this method, melt down the Lily’s Chocolate Chips on a high heat. Be sure to constantly turn and mix the chips as they melt to avoid clumping and burning. *TIP: use a deep bowl so it’s easier to dip into. Once the chocolate is melted, remove the bowl containing the chocolate from the boiler. Begin dipping each pretzel stick in the chocolate, aiming for 1/2 – 3/4 coated. Lay the coated chocolate pretzels out on the baking sheet to dry. While the chocolate is still wet, lightly coat them with the sprinkles for a Valentines day flair! Place in freezer for 2-4 hours until they are hard and ready to be eaten. Ah…the most rudimentary of Valentine’s Day treats. If it ain’t broke, don’t fix it! Here’s how I prepare mine strawberries with Lily’s Chocolate Chips. Keep in mind, they don’t have to look pretty! Just taste good. Using a double boiler, or this method, melt down the Lily’s Chocolate Chips on a high heat. Be sure to constantly turn and mix the chips as they melt to avoid clumping and burning. *TIP: use a deep bowl so it’s eventually easier to dip into. Once the chocolate is melted, remove the bowl containing the chocolate from the boiler. Begin dipping and coating each strawberry in the chocolate, getting at least 1/4-1/4 of the berry covered depending on berry size. I used a spatula to help evenly spread on the chocolate. Lay the coated chocolate strawberries out on the baking sheet to dry. Place in freezer for 2-4 hours until they are hard and ready to be eaten! Have a lovely Valentine’s Day 2019 everyone <3 I can’t wait to read about all the delicious goodies you end up making. And if yogurt, jello or candies aren’t your fav, there are always cookies to be made! As always, have a happy & healthy day. Don’t forget to spred love this Valentine’s Day, not only to others but also yourself. Those all sound so yummy!